Everybody knows the saying ‘Don’t judge a book by it’s cover’, but it’s sometimes very hard to ignore what you see. You only have one chance to make a first impression and people often are put offf by that and don’t take the time or make the effort any more to get to know that person better. They think that what they see is what they get, but under a rough exterior a heart of gold is very often buried. A lot of times it is a wall that has been build to protect someone and once you can make a hole in it, you are pleasantly surprised. This is what happens in this story. Don’t let your eyes and head rule your heart, but take a jump in the unknown. It might be the best thing you have ever done. Enjoy this lovely romantic story. It’s certainly worth picking up. I certainly liked it a lot. 4 stars. Thank you, Sue McDonagh and Choc Lit. In 2009 she learned to ride a motorbike, and now helps run Curvy Riders, a national, women only, motorbike club. 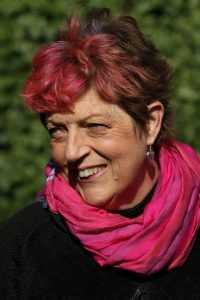 Her joy of motorbikes and her love of writing inspired her to write the Art Café series. Sue, granny of two little girls and proud mum of two stepsons, lives a mile from the sea in Wales. She can often be found with her border terrier, Scribbles, at her art gallery. Scribble thinks the customers only come in to see him. Sometimes, Sue thinks that too. When she’s not painting, she’s writing or on her motorbike. She belongs to a local writing group and the Romantic Novelist’s Association. 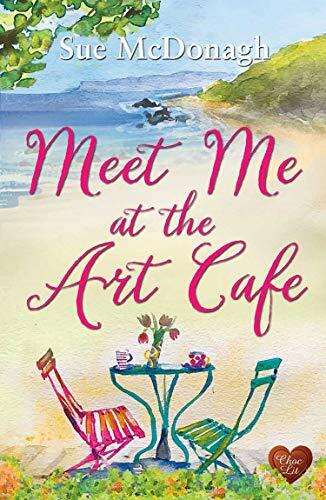 Summer at the Art Café is Sue’s debut novel and the first in her Art Café series.